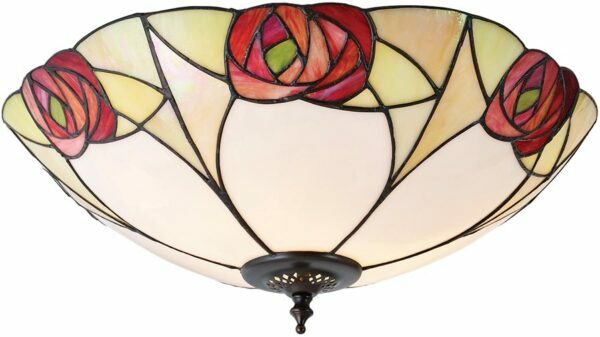 The Ingram Art Nouveau flush Tiffany ceiling light in the Mackintosh style, features a vivid rose in deep mauve on each panel of the shade. With deep borders of marbled greenery and opaque fanned petal design. The Ingram flush Tiffany light fits flush to the ceiling and is ideal for the lower ceiling. Takes 2 x 60 watt lamps. Part of the Ingram Tiffany lighting range, inspired by the Mackintosh rose with a subtle twist. A wonderful inspired design that will brighten any room.